McAfee VirusScan Enterprise combines anti-virus, anti-spyware, firewall, and intrusion prevention technologies to stop and remove malicious software. It also extends coverage to new security risks and reduces the cost of responding to outbreaks with the industry’s lowest impact on system performance. Maximum defense against malware — Safeguards your systems and files from viruses, spyware, worms, Trojans, and other security risks. It detects and cleans malware, and allows you to easily configure policies to manage quarantined items. Proactive protection from attacks — Real-time scanning ensures all your systems, including remote locations, are protected from current and emerging threats. VirusScan Enterprise also guards against buffer-overflow exploits that target vulnerabilities in Microsoft applications. Easy, centralized management — The McAfee ePolicy Orchestrator (ePO) platform is the centralized management console for deploying policies, managing security alerts, and viewing automated reports. Enhanced security powered by McAfee Global Threat Intelligence — McAfee Global Threat Intelligence (GTI) is a comprehensive cloud-based threat intelligence service. Already integrated into McAfee security products, it works in real time, 24 hours a day, to protect customers against cyberthreats across all vectors — file, web, message, and network. McAfee GTI offers the broadest threat data, most robust data correlation, and most complete product integration in the industry. McAfee’s GTI network allows enabled products to evaluate threats on multiple vectors in real time, leading to faster identification of threats and higher capture rates. VirusScan Enterprise uses the McAfee GTI file reputation service to identify suspicious files before they are necessarily identified as carrying malicious payloads. Keeping networks free from a wide range of threats—viruses, worms, rootkits, and Trojans—is more challenging than ever. Whether your organization is a global enterprise with full-time security staff or a small or mid-sized business, McAfee® VirusScan® Enterprise ensures that your endpoint servers, desktops, and laptops remain malware free. McAfee VirusScan Enterprise proactively stops and removes threats, extends coverage for new security risks, and reduces the cost of managing outbreak responses. And even without an update, it stops zero-day threats and mitigates the window of vulnerability—the time between the discovery of a vulnerability and when fixes are deployed. Plus, with McAfee VirusScan Enterprise, you have the flexibility to detect and block malware based on your business needs: on access, on demand, or on a schedule. Defend your systems against viruses, worms, spyware, bots, Trojans, buffer overflows, and blended attacks. Block a broad range of viruses and malicious code — even those hidden in compressed files — with combined anti-virus, firewall, and intrusion prevention technology. McAfee’s industry-leading security also safeguards against spam, phishing attacks, malicious websites, and other threats that often evade standard anti-virus and URL filtering systems. Close the protection gap with McAfee Global Threat Intelligence (GTI). GTI offers comprehensive, real-time protection against both known and emerging threats across all key threat vectors — file, web, email, and network. A cloud-based service using reputation-based threat protection in addition to other techniques, McAfee GTI correlates real-world data collected from millions of sensors globally and delivers intelligence via a complete suite of McAfee security products. Don’t let your anti-malware software slow down end users. VirusScan Enterprise scans faster, uses less memory, requires fewer CPU cycles, and protects users better than any other anti-malware product on the market. Limit the risk and impact of an outbreak if one occurs. Close ports, monitor applications and email engines, and block files and directories, even before .DAT files are issued. Defend your desktops, laptops, and file servers against disruptions. Malware and hackers cannot disable McAfee VirusScan Enterprise. Guard against buffer-overflow exploits that aim at vulnerabilities in Microsoft Windows operating system services, Microsoft Word, Microsoft Excel, Microsoft Internet Explorer, Microsoft Outlook, and Microsoft SQL Server. It also protects IIS services, WinZip, and Microsoft PowerPoint, Microsoft Office Access, Microsoft Office Visio, Microsoft Windows Media Player, and Microsoft Messenger. Control and manage VirusScan Enterprise from one central McAfee ePolicy Orchestrator (ePO) console, and get detailed enterprise-level reporting quickly and easily. 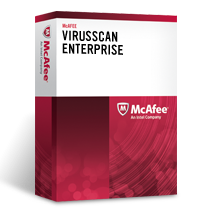 McAfee VirusScan Enterprise uses the award-winning McAfee scanning engine to detect and clean malware and protect your files from viruses, worms, rootkits, Trojans, and other threats. McAfee delivers comprehensive find-and-fix solutions for today’s threats and uses behavioral analysis to protect against new and unknown threats. Protect your systems with McAfee VirusScan Enterprise’s advanced behavioral techniques. With port blocking, file-name blocking, folder/directory lockdown, file share lockdown, and infection trace and block, you can stop many new and unknown malware files cold. McAfee VirusScan Enterprise is the industry’s first anti-malware software to offer patented intrusion prevention with application-specific buffer-overflow technology. Now you can protect your users proactively against buffer-overflow exploits that target vulnerabilities in Microsoft applications, and you can enjoy a more robust, advanced level of endpoint system security by integrating your anti-malware technology with intrusion prevention. With McAfee VirusScan Enterprise, your critical servers and data are kept intact and available for business. For added protection, we lock down McAfee VirusScan Enterprise files and services so that malicious threats and attacks don’t disable them. McAfee VirusScan Enterprise has been designed to reduce system impact while scanning for threats. Its new persistence caching technology dramatically improves both on-access and on-demand scanning. With a reduced memory footprint and faster boot times, users will have lower power requirements than prior versions. McAfee Global Threat Intelligence (McAfee GTI) offers the most comprehensive protection services in the market. With visibility across all key threat vectors—file, web, email, and network—and a view into the latest vulnerabilities across the IT industry, we correlate real-world data collected from millions of sensors around the globe and deliver real-time protection via our suite of McAfee security products. McAfee GTI works anytime, anywhere—at home, at work, or on the road. Centralized management and enforcement is the key to effective and efficient protection. McAfee VirusScan Enterprise is deeply integrated into the McAfee system security management platform, McAfee ePolicy Orchestrator (McAfee ePO) software. The McAfee ePO platform provides centralized deployment, policy configuration and enforcement, and detailed reporting of McAfee VirusScan Enterprise, as well as many other McAfee security products. Configure policies to manage quarantined items easily with the Quarantine Policy Manager. Before an on-access or on-demand scan cleans or deletes a file, it creates a backup copy of the original file and a registry value in the quarantine directory. McAfee VirusScan Enterprise includes the ability to scan Lotus Notes email on client systems. It scans all Lotus Notes client email (HTML text and attachments) messages that come to the desktop. Virus security products are only as good as their most recent updates. With McAfee VirusScan Enterprise, automatic daily updates ensure that your desktops and file servers are always up to date with the latest McAfee .DAT files and engines. With a global research footprint, McAfee Labs provides the most comprehensive global threat intelligence in the industry. Backed by a portfolio of more than 400 patents and a network of millions of sensors spanning the Internet, McAfee Labs delivers unparalleled protection against both known and emerging threats via a complete suite of security products. Along with our McAfee SecurityAlliance integration partners, McAfee offers a wide variety of professional services that help you maximize your investment in security. We help you assess, plan, deploy, tune, and manage your solutions more effectively and more efficiently. Make sure that everything runs smoothly during and after installation with flexible programs from McAfee Technical Support. Our highly skilled and certified security specialists have a wealth of knowledge and resources at their fingertips and can be considered as an extension of your IT team. McAfee Global Threat Intelligence integrates real-time threat information across the six major threat vectors. Download the McAfee VirusScan Enterprise Datasheet (PDF).